In the sport of golf, keeping track of your success is made easy with a scorecard. If you are unfamiliar, in simple terms, it is where you track how many hits it takes to get the ball in the hole. With this, the objective is to get as close to zero as possible and stay with minimal numbers, that is how you improve your score. Each hole on the course has an average of swings that it takes to get the ball in the hole. Now, this is not expected of new golfers, it is more for professionals and of course, for the purpose of becoming better at the game. With that in mind, did you know that there are such things as a scorecard holder? This is a kind of like a wallet for your performance tracker. Think of it has a passport case for the course. There is a wide variety of different products in the industry and the important aspect to keep in mind is which one is the right for you. An item can range from leather to fabric and can even include tiny extra features and design benefits. Therefore, we want to discuss the top ten best scorecard holder that an individual can get today. If you want a quality product, are looking to gift it to your best golfer buddy, or want to buy one so you can start your first game, stay tuned and check out our list. Also, if you are new to evaluating a performance tracker, check out our evaluation below the tenth product. As the first scorecard on our list, we want to discuss a product that is made by one of the leading brands in the golf community. Callaway has long been known for their expert products, simple design benefits, and overall general value. 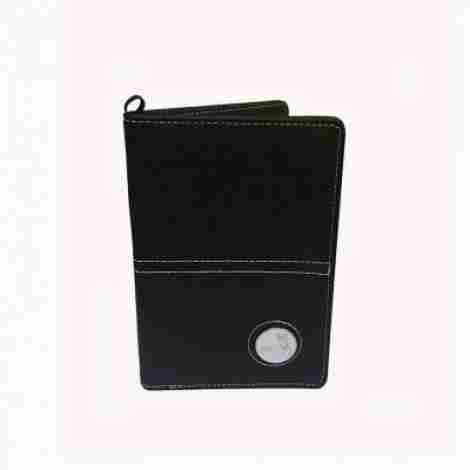 With this, we want to share their leather scorecard holder and what persons can expect from this quality item. 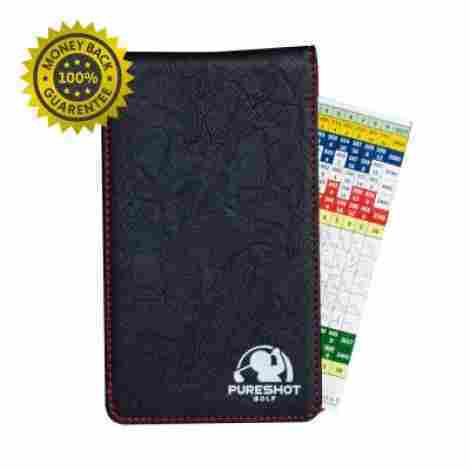 This scorecard holder happens to be a synthetic leather holder that is very high-quality. Etched with the logo of this brand, individuals can assume this product to be compatible with many scorecards. Alongside this, it includes an elastic loop for your pencil so it never falls out. The design of this product is durable and easy to use. In fact, it has a very easy fit design that allows for golfers to place it inside of the back pocket if they need to. With this, it works many yardage books available at many different resort courses. As far as the price for this particular product, what causes the price to be a bit higher than most is the fact that this brand is one of the most known brands in the golf community. With this, it is a quality product that is designed to be easy to carry and durable for years to come. For the price, we recommend it if you want a simple and comfortable design. Compatible with many standard scorecards. Also works with yardage books. Great gift idea for the golfer in your family. Soft leather and detail logo. Can fit in your back pocket. Does not accommodate the large scorecards. Does not come with scorecard. This next product is one of the highest quality designs on the list. The best part is the fact that it even comes in four color choices to choose from. We want to share and discuss with our audience the Fuzzy Bunker Golf Scorecard and what individuals will enjoy from this great product. This brand thought of everything with the packaging of this product. 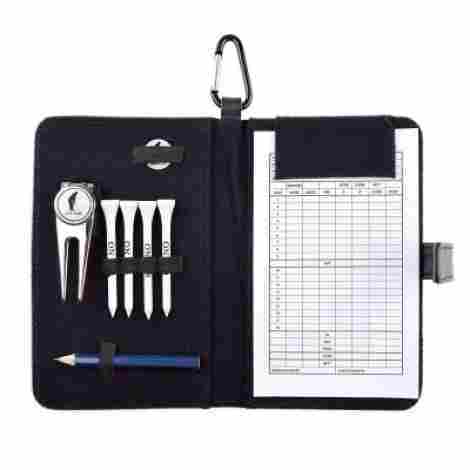 Not only do they include the scorecard holder itself, which happens to be very high quality, but they also include a free golf pencil and tracking PDF. With that, the pencil is very high quality and the scorecard sheet comes in the form of a PDF that can be printed for unlimited sheets. This product is made from an imitation leather. The imitation leather is in fact designed as alligator skin so the card feels and resembles real leather and has a great grip design. Not only that, but it looks very high quality and beautiful on the golf course when you hold it. As far as price, benefits, and overall design, this product is a strong construction product that fits most scorecards and even has an elastic band to ensure a snug and secure fit with no movement. With this, the hard backing allows individuals to write their score on the spot and have a hard surface to write it on. As we said, it comes with four color choices to choose from. Quality design and easy to use. 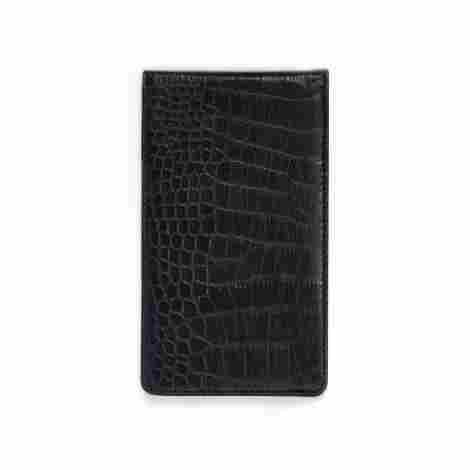 Soft alligator imitation skin cover. Does not fit into a pocket very well. The “B” logo is not attractive. This next product comes from a brand that excels at creating quality products that are durable and designed to last. We want to share with our audience the ProActive Sports G Score, a great scorecard if you want simplicity and an easy to use design. Here are two design elements. The look of this product is a classic leather look that is high quality, simple, and durable. To add to this, individuals will agree that the design is very comfortable to the touch and even feel padded. The leather is scratch resistant and although it is not real leather, it resembles real leather very well. The elastic bands inside of this product are also very high-quality. They hold your pencil and scorecard very well. Overall, the design is luxurious, and the fit of the product adds to the benefit of being able to carry your tiny pencil with the holder itself. As far as the price for this item, it is very simple and nowhere as busy or flamboyant as other cardholders that are very bright. 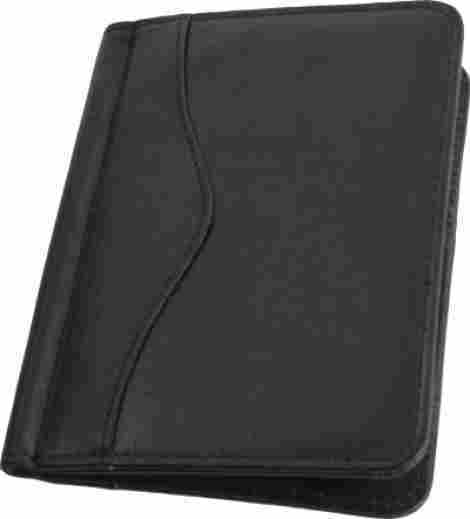 This product is all black leather, has a classic look, and may even match your wallet for a synonymous appearance. With that, the scorecard can fit any sheet that is 6x8. Unfortunately, anything above that or below may be too uncomfortable or fall out. Minimal flexibility with paper sizes. It is time to bring it up a notch and share an authentic product. This item is made of genuine calfskin leather and is very soft and high quality. 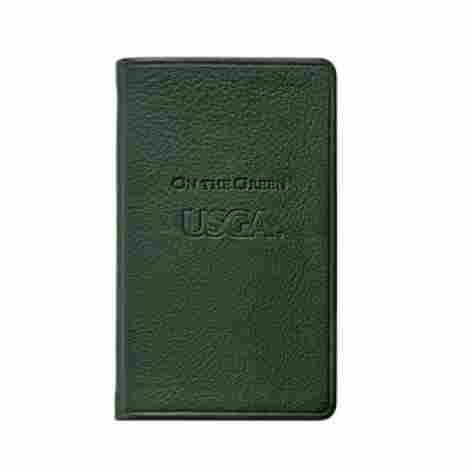 From the Graphic Image brand, they bring us the USGA On The Green Leather holder and plenty of positive features to go with it. Here are two things to consider this excellent product. This product happens to have been Smyth sewn during construction and manufacturing. The reason being is that this style of sewing adds more longevity, strength, and durability. To add to this, it also has a double-faced satin ribbon marker design and it is very high-quality for enhanced durability. With that, it is an authentic product. This item happens to include the United States Golf Associations rule book in brief. With this, people can expect an authentic item that is made from a high-quality maker. To add to this, it also comes with a 164 cream white acid-free paper. This is a quality product for golfers. Alongside this, it makes a very premium gift for the golfer in your family that you care about. As far as the price, it is not too costly, but it is more costly than other holders. This is considered a premium holder because of the genuine leather and the construction. Alongside this, it comes in a gift box, it has quality extra benefits, and the leather is very soft. It has great reviews and users will enjoy that it will last the test of time. Score book with 56 rounds. Smyth sewn for longevity and double-faced satin ribbon marker. May be considered too small. We are in the middle of our article, and we want to talk about a simple product that is designed very well. From the PureShort brand, it is time to talk about the next golf tracker holder on our list. This item is very simple, comfortable to use, and has a protective covering that is strong and can last a long time. Here are two added features to talk about. This scorecard is designed with a 100% satisfaction guarantee or money back and the brand has an excellent customer service. With that, if the product comes scratch or is not what you had hoped for, you can return it. Although, the return is very rare considering that many individuals are very happy with the product. This product is designed and sized very well. The size of this item is 7.25 inches by 4.525 inches and it is designed to fit in the back of your pocket easily and effortlessly. With this, it adds no extra bulk to you and you can easily take it out whenever you want to write your new low score. As far as the price, this product is worth considering if you want a simple scorecard holder from a brand that focuses on quality and customer satisfaction. 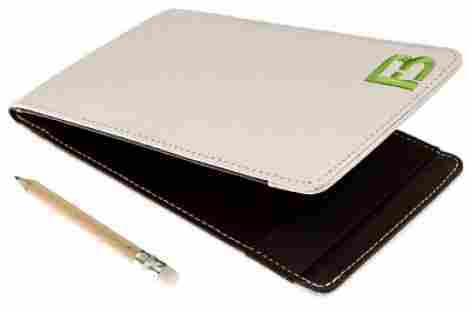 With that, the protective design is intended to prevent ripping or smudging and also the leather is scratch resistant and very sleek. For the price, it is great for many golfers. Protective covering is very strong. Not as soft as some individuals may expect. It is time to talk about the bourbon brown Hide and Drink Rustic Leather Performance Holder. This product is made of genuine leather and it happens to have a quality rustic feel and design that is very special and unique. With this, we find this product to be designed for the everyday golfer that wants durability and functionality from their products and gear. This item has a high quality and very tight elastic strap that allows for a golfer to secure the scorecard tightly. With this, it prevents any of your scores to be lost and golfers can focus on the game. It7 also has a small strap section for your pencil. This design can also accommodate many pencil designs and pens. This product comes with an easy storage design. The design of this product is designed so individuals can place it safely in a golf bag or even the back of their pocket. 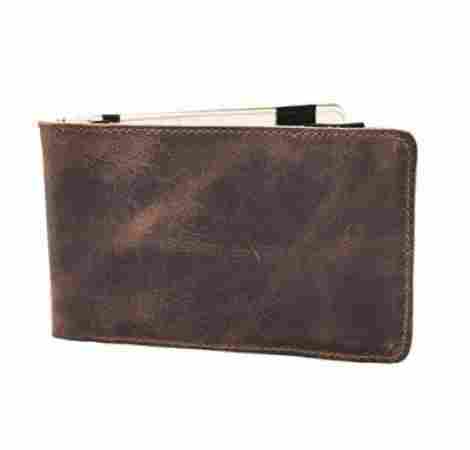 The unique element of this product is that the brown leather design resembles that of a very prestigious and high-quality wallet. The price of this performance tracker resembles the fact that it is made of a high-quality material and is also very premium feeling. To add to this, individuals will like that it has a rustic and modern design with a traditional color tone. Overall, it has a white canvas interior, it has a quality strap and elasticity is superb. For the price, we recommend it if you want style and luxury alongside functionality. It also makes a great gift for any golfer. Feel secure with the tight strap. The width is very small for most cards. The strap is very tight. If you want to show a bit of American spirit on the golf course, this is the scorecard to whip out every time you go to write your new low score. 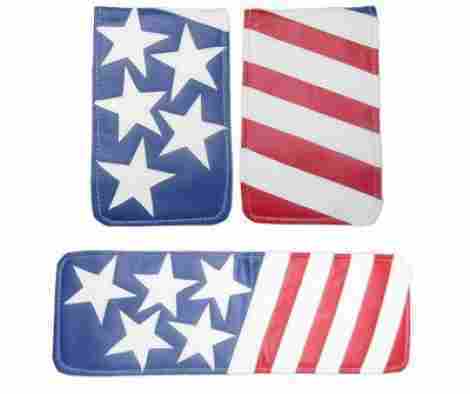 There is nothing more American than the flag, and this product displays it proudly. We are talking about the Sunfish Leather and the overall design of this product. Individuals will find this item to be a very great design that has the perfect size. This product is designed for golfers to be able to carry everything they need to track their score in one simple place. The card is 100% handmade and the elastic bands are manufactured to be comfortable and easy to use. With that, the bands allow for the carry of your scorecard, pencil, and even a small yardage booklet if you need to. This item is sized to be 7” x 4.5”. With this, people can expect the size to fit very well in the back of your pocket. Considering this, individuals will find this item to be easy to carry, use, and take out during any golf game. Alongside this, the premium leather is high quality and very soft to the touch. As we said above, this product is designed to be very modern and also show some proud spirit. With that, the color design is stylish, although it may fade after years of wear and tear. It is designed to be easy to use, but the price makes it the highest on the list so far, and the leather is actually only synthetic. However, if the color calls to you, you won’t regret it. High quality and durable leather construction. Color may fade with sun exposure. 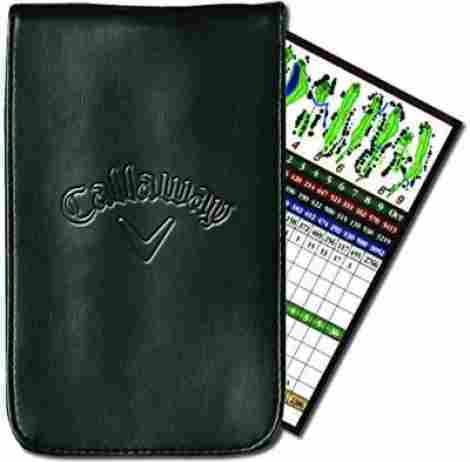 We want to talk about a golf leather organizer, that not only allows for an individual to keep track of their scorecard, but it actually allows for the golfer using this item to keep track of other important golf items. We have not seen anything like this organizer before and it is worth it if you want a quality product. Let’s talk feature number one! This item is not just an organizer, this item comes as a presentation gift. Meaning, individuals can gift this item because of all of the amazing and great accessories the brand has included. For instance, this product comes with a stainless steel divot tool and ball marker. To add to this, it also is designed and includes four white tees. It also comes with a magnetic scorecard holder and pencil. What more can we ask for? To add to all of the accessories that this product comes with, it also comes with real leather. This item is built from quality real leather and happens to be a high-quality and appealing design structure. The inside is very soft and smooth and the elastic band is also stitched to be durable and last the test of time. Overall, it happens to be a great addition to any golfer. Gift it as a gift or gift it to yourself, you will not regret it. Individuals will enjoy that this product is soft, made of real leather, and comes with plenty of extras. Compared to brands that charge double for their cards, this product is a no-brainer to consider. With this, the price is well below what most brands charge for such a quality item. Contains stainless steel divot tool. Comes with bag clip for easy carry. Comes as a gift set. May be too big to carry. We are coming towards the end of the list and this next scorecard has a textured leather design that is stylish and worth considering. With five color choices to choose from, this item is made of synthetic leather, is very beautiful, and has an alligator-like texture that makes it easy to grip. This is the Magic Vosom golf tracker and here are two benefits. The elastic bands in the inside allow for the golfer to be able to place the scorecard easily and effortlessly. To add to this, individuals can fold the product flat for easy marking and fold it back for easy carry because of the small and compact quality size. As we said above, this item comes with various color choices. Yes, this product comes with five colors and they are all very stylish. Individuals can choose red, blue, brown, and even black. The size is compact, the texture is gripping, and the simple design resembles that of a wallet. As far as the price and benefit for this item, individuals will like that it is high quality, easy to put in your pocket, and easy to use. The card allows for easy marking and has a snug fit for the paper inside. Overall, it can only be bought by specific sellers but, it is priced fairly for the design and the qualities. May be too big for certain pockets. This is the last item we are to talk about for the list and after much research, we want to finish our list with the CrestGolf Executive Cover Holder. This item is designed from quality PU leather and it happens to have great workmanship and details that make it a great gift for any golfer, even you! Here is benefit and design quality number one. This product comes with a buckle. The buckle design allows for the holder to easily be clipped on clothes or a golf bag. With this, it is very compatible and individuals will like the fact that it is portable. The design is simple and easy to carry, making it a great addition that does not feel like bulk in your pockets. This item comes with a free ball marker. The ball marker is simple and has stainless steel look and silver design. With that, it has the word “golf” on it and it matches the style of the holder as well. Overall, the design is simple, durable, and the PU leather feels great and is damage-resistant. We are happy to say that this product happens to be the most affordable on our list. With that, the design is very simple and it does not have much of specs and features as other holders. Still, it is a great product for a first-time golfer or individual that wants a simple holder design. Comes with buckle and ball marker. The strap is not as tight as other ones. As you can see, many holders happen to be made of quality materials and designed to last. With that, it is important to evaluate which product is the best for your needs. For instance, you may want a specific product because of the design, but is it easy to hold or does it fit with your particular size sheet? Therefore, it is important carefully consider numerous aspects prior to clicking the purchase button. This is where we share with our audience how we found these top ten best products and what is most common as far as design and what is available in the industry. So, if you want to know how we picked these and what is more available in the industry today, keep reading! In looking for the best product, we highly suggest moving forward by finding products that have above four stars in ratings. With that, the reviews also help individuals find the best quality design. For us, we strive to ensure that each product has a four-star rating or above and plenty of positive reviews. If we do not encounter that, then our next concern is to ensure that all of the products we shared are from a brand that is reputable and trusted. With that, the reviews help us identify what individuals have to say about each particular product. For instance, if you are concerned about durability, reading the reviews helps you get to know how high quality and long lasting a product is by getting to know the experience of other individuals. So, this criteria helps set things into motion, but the next one is the main one when considering a performance track sheet holder. The material design is most commonly the most important criteria, the reason being that you want to ensure that the material of each product is of the best value and design. With that, the two most common materials that we encountered range from faux leather to real leather. These two materials range as far as quality and texture. Most commonly, faux leather is designed to resemble alligator skin or some kind of pattern, while real leather is very soft and comfortable. With that said, we also wanted to ensure that the interior material was of great quality too. Many interior materials are made of a fabric-like material that is either soft or very smooth. Now, if you are considered about cleaning the material, don’t be. Most holders are very easy to clean, just wipe them down or use a leather cleaner wipe. Now, speaking of the inside of a holder, let’s talk about the next criteria. Just to recap, this is what we have to say about the material. The two most common materials are leather and faux leather. The interior material is either smooth or soft. The material is easy to clean. The material is well stitched for longevity. As the next criteria, another quality aspect to consider is the interior design. The interior design of a holder tends to be universal. They most commonly have an elastic band design that allows for the individual to place the sheet of paper firmly and safely without concern that the band will fall out. With that, the band material tends to be very well stitched and very tight as far as elasticity to ensure that the papers will not fall out or go loose. However, we want to move forward and discuss the interior design as far as convenience. Most holders have space on the inside for individuals to be able and have a pen attached to the inside of the holder, or at least be able to attach it somehow to the side. With this, some other holders have higher quality materials such as the ability to have an individual attach a tee of a marking tool. Here are some bullet points to consider. The interior bands are made to be elastic for easy placement of the sheets. The elasticity tends to be really tight. The interior may have space for other small items such as an ID or a marking tool. This last criterion is more of a summary of a bunch of factors we wanted to take into place. These factors are more of details that you can keep in mind when picking out the best item for you. There is a wide variety of different types of this products online. There are leather, non-leather, green colored, brown, beige, black, even bright orange colored holders. Whatever style or color you are looking for, it’s out there, so keep your options open. The size of the holder may be one of the most important aspects to consider. The reason being is because the size will determine what kind of sheet you use. With this, it is important to consider that there are various sheet sizes as well. So, whichever one is the most favorable style for you and your play style, consider the size. The size will also determine if it can fit inside of your back pocket or not. Keeping the price in mind is another important aspect. The reason being is that you want to ensure you get a great deal for the price. Most commonly, real leather goods are more costly than other products. Therefore, this is an important aspect to consider. Now, this is actually determined by the brand. Many brands will include different products with the purchase of their items. For instance, some brands will include a free pencil, while some brands will include a downloadable PDF of a specific track sheet. Some brands even design the holder as a gift set with a divot tool or other items. Overall, there are many different types of holders available. The most important aspect is to make sure that the holder you like is designed to be durable and have strong backing. With strong backing, individuals can easily take it out and write on it without needed a hard surface. Now, it is time to move forward towards the frequently asked questions. Q: Can the holder get wet? A: Although they are not designed to be waterproof or water-resistant, some holders can get slightly wet because the water will wick off. However, the interior of the holder cannot get wet because not only the product will get damaged but so will the sheets of paper inside of it. Q: Are the elastic straps replaceable? A: Actually no! If the elastic bands that hold the paper inside tear or break, that is the end of that holder. However, most commonly the brand will have a warranty or return policy if the product does not remain durable within a certain period. Q: Can I place it in my back pocket? A: This all depends on the size of the holder. Most commonly, a specific holder is small enough to fit in the back of a pocket but large enough for the paper information to be easy to see. Q: Is there a place to put my pencil safely? A: Most holders do have a tiny little spot where an individual can place their pencil safely and easily. With that, the pencil holder tends to only hold mini pencils and nothing too large.